Today, Canada's Minister of Public Safety and Emergency Preparedness, the Honourable Steven Blaney, and France's Keeper of the Seals and Minister of Justice, Christiane Taubira, signed the Declaration on the Cooperation Program between the Department of Public Safety and the Ministry of Justice of the French Republic. The declaration was signed in Ottawa and improves security ties between France and Canada. In particular, the declaration focuses on key issues such as the correctional programs offered to inmates, managing radicalized offenders, and how to address the growing complexities around inmates' mental health needs. Correctional Service Canada has a longstanding history of sharing information and correctional expertise with key partners internationally. Its relationship with the French Administration Pénitentiaire dates back a number of years. Overall, the already strong Canada-France relationship has deepened in recent years. The Canada-France Enhanced Cooperation Agenda (ECA), jointly announced by Prime Minister Harper and President Hollande in Paris on June 14, 2013, provides a strategic framework for implementing further economic, security, social, and political initiatives between the two countries. The declaration signed today also covers many aspects of corrections all countries must address, including how to assess the risk an offender poses and the most successful methods of gradually integrating an offender back into the community. "The Correctional Service of Canada is closely collaborating with our justice and correctional colleagues in France. Arrangements like this declaration provide an excellent opportunity to advance our respective priorities, such as keeping our communities safe, and we are eager to build on some of the productive exchanges we've had so far." "I am thrilled about this cooperation, which is going to help us advance on some difficult matters. In 2014, France committed to a large penal reform to better combat repeat offending by partly drawing on the Canadian model. Today, France must also deal with a disturbing phenomenon: violent radicalization. We have no doubt that our discussions, especially on these topics, materialized through this agreement, will continue to be productive." 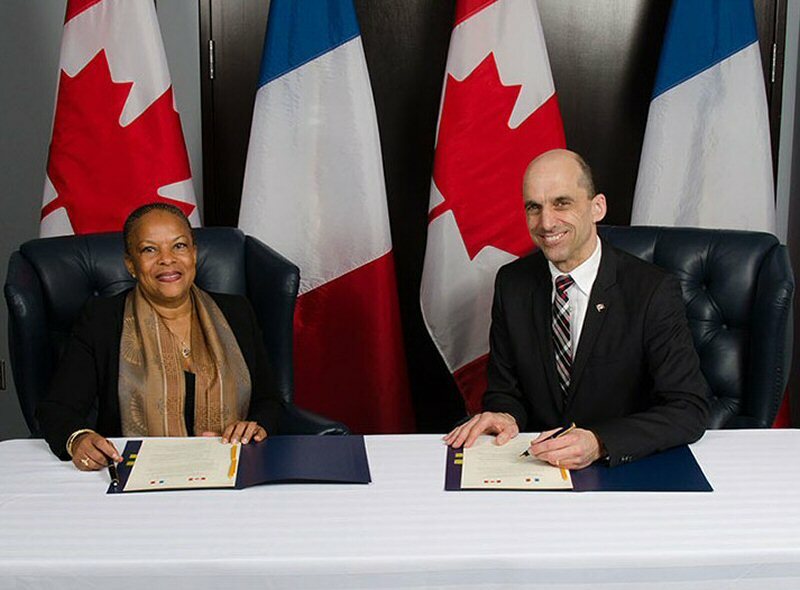 Christiane Taubira, France's Keeper of the Seals and Minister of Justice and the Honourable Steven Blaney, Canada's Minister of Public Safety and Emergency Preparedness sign a Declaration on the Cooperation Program between the Department of Public Safety and the Ministry of Justice of the French Republic in Ottawa on April 23, 2015.